concentrate high noise fabrication processes into one area. 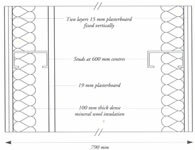 A very high performance drywall partition has been developed to give considerably higher sound transmission loss than a traditionally rendered cavity brickwork wall but with less than one-third of the superficial weight. The drywalling is made of two independent wall structures with metal studs 600 mm apart. 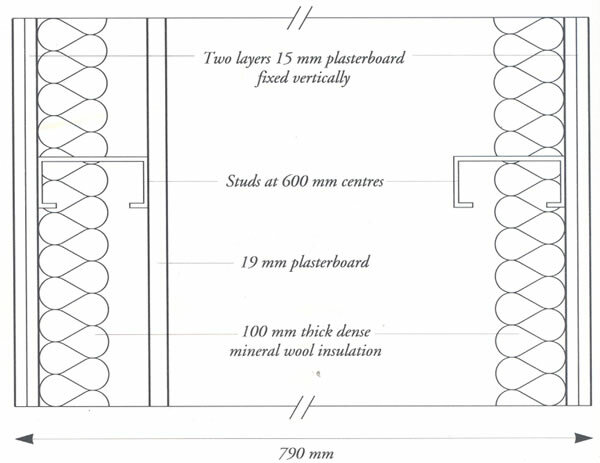 One wall has two layers of 15 mm plasterboard on the outside and a single layer of 19 mm plasterboard on the inside. The cavity is partially filled with 100 mm of dense mineral wool insulation. The secondary skin of the drywall is made up of two layers of 15 mm plasterboard on the outside of the studding and a further 100 mm of dense mineral wool insulation on the inside. The width of the cavity and the absorption by the mineral wool insulation within it provide good attenuation of transmitted sound energy. An average sound reduction index of 77 dB at one cinema complex. The partition is claimed to be equally suitable for industrial areas. Designed by Vernon Cole Associates (Acoustic Consultants).